Banbridge Academy has started the new year with a new principal, and as Mr Robin McLoughlin takes up the reigns of an institution with almost 230 years of history, he has said he is delighted to have been appointed. It is a full circle for Mr McLoughlin who started out his teaching career at the Academy in 1995, when he spent 11 weeks there as a student teacher. “The Academy is a very welcoming and warm school, and very much at the heart of the community,” said Mr McLoughlin. “There are excellent relationships between our pupils, parents and my colleagues and it is a special place to come to work each day. Taking over from outgoing principal Mr Raymond Pollock, Mr McLoughlin said: “I have had the privilege to work alongside Mr Pollock on many different forums across Northern Ireland. “He is a man of integrity who truly understands education and the critical importance of helping to develop and prepare the young people for adult and working life”. Mr McLoughlin also paid tribute to Mr Pollock’s predecessor, Mr Winston Breen, who he served under during his time as a student teacher. “I know I will certainly not be able to replace Mr Pollock or Mr Breen - two men of distinction in the world of education - but I know with God’s help I will be the best possible leader that I can be. Mr McLoughlin, who was previously principal of Grosvenor Grammar, said moving closer to home was just one of the factors that drew him to apply for the post at the Academy. “I was very happy and content in Grosvenor Grammar School and had the honour of serving the school for five years as Vice Principal and almost seven years as principal. 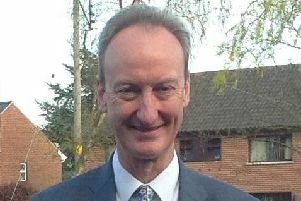 The Academy and Grosvenor are both great schools with fantastic pupils, staff and support from the community, however as I am getting married in the summer, moving closer to home, to my family roots, and who I am at heart – a country man, seemed to make the Academy the right move for me,” said Mr McLoughlin. “The main reason I am certain I will be happy in the Academy, is that both schools have a similar ethos - not only provide high quality academic education, but also the best possible pastoral care and also a vast array of extra and co-curricular activities. Speaking of his vision for the Academy Mr McLoughlin said: “I intend to do what I have always done in my career and work with the pupils, parents, my colleagues, the Board of Governors and the wider community to ensure that the Academy continues on the journey of continuous improvement. “My aim is to provide the best possible education in and outside of the classroom. Mr McLoughlin added, “I want the Academy to inspire our pupils, within a supportive caring environment, to be lifelong learners and to realise their full potential . “I believe it is essential that the school works in conjunction with our parents to ensure that we support our young people in this complex world.